There were several working devices as well that SemiAccurate got to play with so it looks like 5G is actually imminent on the consumer side. During their Snapdragon Technology Summit today, Qualcomm did what we all expected and announced the successor to the 10nm Snapdragon 845 SoC, the Snapdragon 855. Unfortunately they didn’t give out many specs on the device, the ones you want will be out in a few days. Instead you will have to look at pretty pictures of the CPU itself, for example this one. As you can tell from this SoC encased in plastic, it is, umm, an SoC. Other than that not much, the back was covered so nothing to be gleaned there. That said given the number of them up and running at the show, we have no doubt they are real. Actually given that we held working ones that used OTA frequencies in Hong Kong over a month ago, we didn’t doubt it then either. Better yet the entire venue was lit up with 5G so it was really an OTA demonstration, not a canned or wired version. So what do we know about the 855? Just a few bits so far starting with the hot topic of the moment that no one can really define, AI. The 855 is Qualcomm’s 4th gen AI Engine, a name coined with the 845 for the agglomeration of resources all usable by AI software. Qualcomm claimed it is 3x faster than the previous generation, 2x faster than the other Android focused smartphone SoC, and faster but not 2x faster than the other 7nm non-Android oriented SoC. While this is all probably true the really important thing is how developers use the resources and here Qualcomm seems to have the real advantage. Although not directly tied to the Snapdragon 855, Qualcomm’s SenseID ultrasonic fingerprint sensor is now actually released. SemiAccurate went into great detail about the technology a few years ago but the short version is that it works through glass, is unaffected by things like moisture and lotion on the skin, and gives a 3D map of the fingerprint, not just 2D. If it works as well as the prototype in 2015, SenseID could be a big step forward, plus it can put the lotion on the skin AND get the hose again, all with stunning accuracy. 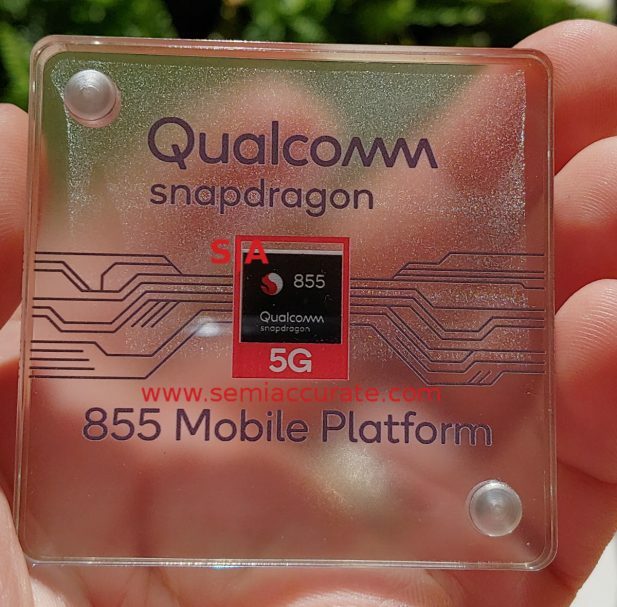 Then comes 5G which is integrated into the Snapdragon 855. Unfortunately there were not many details given but we assume this will be the functional bits of the X24 Cat 20 modem demoed earlier this year for sub-6GHz calls and optional X50 support for mmWave. More details when we get them.